Author David Sax is a man on a (delicious) mission. His goal? To preserve the delicatessen tradition. His new book, Save the Deli: In Search of Perfect Pastrami, Crusty Rye, and the Heart of Jewish Delicatessen (Houghton Mifflin Harcourt), is a mouthwatering paean to corned-beef culture. The Oct. 20 launch party for his book, appropriately, was held at Ben's, a sprawling delicatessen in Manhattan's Garment District. Between bites, TIME senior reporter Andrea Sachs caught up with the knish connoisseur. All right, corned beef or pastrami? It depends where I am. 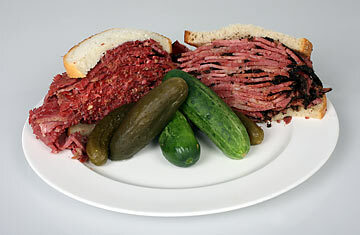 Pastrami if I'm on either of the coasts, the Atlantic or the Pacific Coast, and corned beef if I'm in the Midwest. Because Jewish delicatessens are an endangered species and I didn't want to see them go away. I wanted to find out why they were disappearing. I found out the Jewish deli has certainly been going away for some time, but that hope isn't lost. Wherever there are deli lovers and people who salivate when they get a whiff of corned beef or when they put their tongues on a matzo ball, they're transported back to this pristine wonderland of their youth  whether they're Jewish or not. What makes a good deli? And how many did you visit while writing your book? I visited about 150, 160, something like that. I don't have an exact tally. And Canada and Europe too. What makes a good deli is a place that, one, is generally family owned or owned by individuals that care. Delis that are owned by large corporations tend not to have that same soul. And two, delis that make as much of their food from scratch as possible. You know, Ben's here  pickles or corned beef and tongue, all on site. And that makes a difference in the flavor because you have control over it. There are a lot of places that sell pastrami and corned beef that they get shipped in from hundreds or thousands of miles away, and that's the difference between a deli and a Jewish delicatessen. I don't have one. You see throughout the book I talk about a lot that I love, but there's no one absolute favorite. How in the world did you keep from gaining weight on your book jaunt? Portion control. If I went into a number of delis in a day, I would taste everything that was put in front of me, but I wouldn't finish it, because I didn't have enough room in me to finish it. And, you know, regular exercise, but nothing insane. I didn't go on a cleanse or a diet after, and maybe my cholesterol is 30,000 or whatever, but this is food I feel good eating as long as I don't eat too much of it. Gribenes have been referred to as Jewish popcorn or kosher pork rinds. It's basically chicken skin fried in schmaltz. They're crispy and mixed with fried onions. I'm telling you, when you have it with chopped liver, it's the most incredible thing because you get this crunch and this surge of chicken flavor. I mean, listen  what's the best part of chicken? The skin, right? Have people turned away from delis a little for health reasons? Of course, absolutely. And I think a lot of that is overblown. You know, look, are you going to eat this food every single day, three meals a day? No, that's not advisable, just as it isn't advisable to eat barbecue three meals a day, every day. But if you have it once a week or, you know, a couple times a week and you vary it up and you don't eat tremendous amounts of it and you mix in with a lifestyle that is rich in exercise and other sorts of things, then I see no reason why you can't eat this. My hometown is Detroit. What kind of a deli city is that? Detroit is a great deli city. If only GM could learn from what the delis in Detroit are doing! The best rye bread anywhere  double-baked, crispy, warm rye that they serve their sandwiches with  and great corned beef. It's a passionate deli town.